Muneera Allie: Xenophobia: No man- wot kine people?! Xenophobia: No man- wot kine people?! After hosting a most fantastic… er did say FANTASTIC!! World Cup event…. bragging about our unity n all… the wonderful Rainbow Nation …. it’s sad that South Africans have yet to handle their fear of the “other”. Wiki describes xenophobia as the “ the uncontrollable fear of foreigners… manifest in … the relations and perceptions of an ingroup towards an outgroup, including a fear of losing identity, suspicion of its activities, aggression, and desire to eliminate its presence to secure a presumed purity”. Locals claim unfulfilled promises post 94, lack of service delivery and unemployment as reasons for violence against foreigners. So that’s reason to throw someone off a moving train? How this seems fair escapes me. And of course, not forgetting, it’s selective xenophobia too. Yeah! Let’s not include those beautiful fair-skinned people… no… we don’t fear them… they don’t steal jobs. If you’re asking me, the real reason has more to do with that koeksister mentality I mentioned a little while ago. Also, it seems our attempts at setting up little temporary camps and the like are not dealing with the actual problem - but only the symptom. Somehow- I don’t see how protesting and “blowing a vuvusela against xenophobia” is going to help. I think we’d do much better at attempting to change the perceptions and relations of the “ingroup”. And here we might consider more (if not vigorous) education, interaction and sharing information on the various cultures. I have many foreign friends and acquaintances whom I’ve come to love and respect. Wonderful, hardworking people that South Africans can learn so much from if they only took the time. Quite honestly, my life would sadly change if they were to just "go home" as some insist. 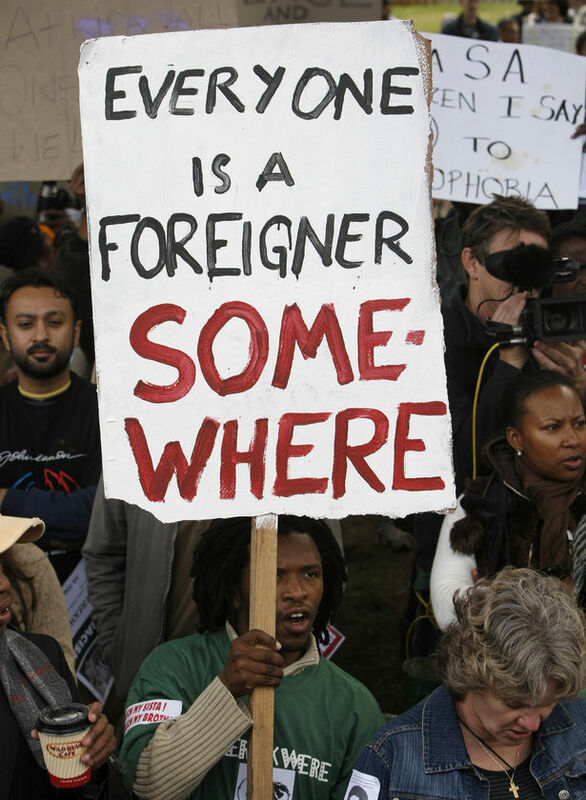 South Africans should not blame their own laziness and inaction on foreigners. Let’s not allow that koeksister mentality to reign. I reiterate, blaming your circumstances on the “other” is nothing but a cheap copout. Also, would our wonderful World Cup even have been possible without everyone in SA's contribution? Just glancing at South Africans amazing achievements to date, why are we finding it so difficult to handle this issue? We’ve already proven we can do anything we set our minds to. Can see this is a matter close to your heart, well written.